I first tasted creamy carrot soup about 20 years ago when my sister took me to the China Moon Cafe in San Francisco. It was so creamy and spicy that I decided to learn how to make this soup in a raw version. 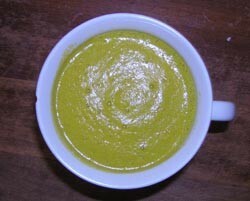 I have owned a Vitamix for over 20 years and knew that it is capable of making a raw version of this tasty carrot soup. My version is naturally gluten-free since I do not add any soy sauce that contains wheat. Too many companies jump on the gluten-free band wagon and are using misleading advertising to get you to purchase their products. I got inspired to create this recipe because my wife went over-seas to visit her parents and I was extremely hungry and missing her fantastic cooking. She creates many raw and probiotic dishes for us to eat. Right before she left on her trip she was making some incredible vegetable and fruit smoothies in our Vitamix. The light one on my head and I thought to myself “why not make some hot vegetable soup?”. I got into my experimental mode and looked into the huge supply of food that my wife stock-piled in the refrigerator. I cut up approximately 1/2 of a pound of carrots, added a few sticks of organic celery, and threw in a couple pieces of green onions. The soup needs to be creamy so I added a quarter cup of almonds, and a half cup of flaked coconut to give it an Asian flavor. China Moon's carrot soup has ginger zing to it so I cut up a thumbnail piece of ginger and added this along with 1 tablespoon of raw apple cider vinegar to give it a slightly tangy flavor. The soup was still missing salt and some intense flavor to make it stand out. We use South River miso in our vegetable soups and I knew that this would taste good in the carrot soup. I tried 3 teaspoons of South River dandelion leek miso. I added enough water to make approximately 1 L of the soup and puréed all of this in a Vitamix high-speed blender until it was warm. This soup tasted good from the get-go. I added a small amount of red hot chili peppers because I like my soup spicy. I think that you will really enjoy this soup as it is a comfort food for me while my wife is on vacation. I plan on sharing this with my entire family when she returns. It's very colorful and worthy of serving as a main dish. Blend everything in a high-speed commercial grade blender like a Vitamix until it is warm. You can add more salt, pepper, or miso depending how salty and spicy you like it. Serve this soup immediately. If you want to retain all the probiotic health benefits you can refrigerate this soup and eat it cold the next day. The South River miso is also a very special ingredient for making soups. All their misos are hand crafted in small batches. They are never pasteurized. Miso is used by the Japanese for making soup. It's concentrated and very tasty. South River makes naturally fermented un-pasteurized miso that has many natural health benefits to it. Many of their misos are soy-free. Miso is a probiotic food that produces both B and K vitamins in the small intestines. Additionally, miso contains active enzymes that prevent the growth of harmful bacteria in the intestinal tract and will aid in properly digesting food. The Vitamix has been part of my kitchen arsenal for over 20 years. A day hardly goes by without using it. When I traveled back and forth to the Philippines while dating my wife, I lugged it with. The people in her household were fascinated with it. I am still fascinated with the unbelievable feats that it accomplishes in the kitchen. There are similar blenders available on the market that tout themselves to be just like a Vitamix. I probably would give one of them a try but my Vitamix will not seem to quit working. Every kitchen really should have one of these because it makes the preparation time so quick for gourmet and healthy chefs. They advertise them to take the place of about 20 appliances. Maybe. I don't care about that aspect. I like the fact that I can make a creamy smoothie in less than 60 seconds that will beat the taste of any $5 smoothie shop drink. I use the Vitamix to make the most delicious creamy smoothies on the planet. When it comes to making hot or cold soups, nothing can compete with this machine. And don't forget that you make raw vegetable soup in just minutes. I usually experiment with whatever vegetables that I have in the 'fridge. Some taste excellent while others are consumed for nutrition-if you know what I mean! One of our friend's has a contest with his kids to see who can drink their "green" drink the fastest. I don't advocate this method because the juice still needs some saliva to get properly digested.